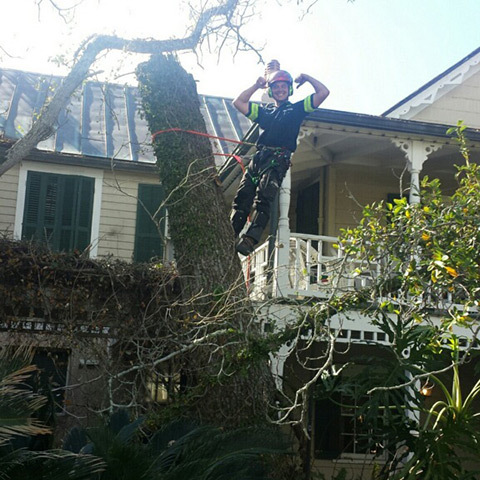 TREECO is proud to be the premier tree trimming Jacksonville FL company, offering comprehensive services to homeowners, property managers, and commercial clients. Jacksonville, Florida, is one of the state’s most remarkable cities—a place with numerous distinctive features that draws people from all walks of life. The largest city by population in Florida, Jacksonville sits in the northeast corner of the state, 25 miles south of Georgia, right on the Atlantic coast. It’s home to several military installations as well as a deep-water port. The medical community is well-represented in Jacksonville, as well as the banking, investment, and health insurance sectors. Many visitors come to Jacksonville every year to visit its 22 miles of Atlantic beaches. Neptune Beach and Jacksonville Beach are two popular places to spend a day in the sun. Numerous beach parks are scattered along the coastline, providing places where people can rent cabins, camp, picnic, hike, walk, go birdwatching and mountain biking. Nature enthusiasts love the Jacksonville area because of its eco-diversity. Forty-six thousand acres of coastal wetlands, marshes, and hardwood forests make up Timucuan Ecological & Historic Preserve. It’s a great place to roam and explore, where visitors can appreciate the vast numbers of plant and animal species present on the land and in the waterways. Besides the Preserve, there are many other places in the Jacksonville area to visit where nature can be fully experienced and appreciated. Even the Jacksonville Zoo, with its 2000+ exotic animals, contains botanical gardens that delight and inspire. Golfing is popular in Jacksonville. Eleven top-flight courses draw golfers from all over the area. Other sports enthusiasts can enjoy events at different venues around the city. Jacksonville holds its own when it comes to culture and entertainment. From modern facilities to colorful historic buildings, the city offers concert-goers and gallery-wanderers a whole range of venues to choose from. The city also draws thousands of people who come specifically for the work opportunities. Between the Naval Air Station Jacksonville and the Naval Station Mayport, almost 35,000 people find employment here. Health care establishments provide jobs to another 13,000 people. Banking keeps over 16,000 Jacksonians employed. The twenty top companies to work for in 2018 in Jacksonville (a list curated by Zippia) include Acosta, CSX, Chicago Title Insurance, Crowley Maritime, Black Knight, Baptist Health, FIS (Fidelity National Information Services), Firehouse Subs, Astadia, Idea, Haskell, Modis, North Florida Sales, Winn-Dixie, Florida East Coast Railway, Southeastern Grocers, North Florida Sales, Stein Mart, and the University of North Florida. Hundreds of people in Jacksonville start their own businesses every year. In fact, recently the city was named the best city in the United States in which to start a business. It received the acknowledgment from Wallethub.com, based on the fact that corporate tax rates are low, there’s a large pool of potential workers, financing is accessible, and there are many thriving young companies. Jacksonville is a great place to raise a family. A robust school system provides children with a good education and there are many beautiful neighborhoods and communities with affordable housing. TREECO is delighted to serve the people of Jacksonville. Our roots are in this area and we call it home. We work hard to be the best in all areas of our business from customer care to communication to the delivery of services. We know our clients have a choice; we work hard to make sure they’re glad they chose TREECO.